Rural house built in an old oil mill, of which we keep the name, the grinding stones and the pump of the press. Comfortable and bright building, located on the outskirts of one of the most beautiful villages of the Alcarria, Alocén (National Prize of Beautification of towns in the year 1981). The town of Alocén is located at the foot of the mountain, sheltered from the air of the north and over the swamp of Entrepeñas, surrounded by native vegetation, mainly oaks, oaks, Aleppo pine (Pinus halepensis), Kermes oak and aromatic plants (rosemary) , lavender, marjoram, lavender ...). The urban area is very careful, both in its construction and in its maintenance and cleanliness, conserving the richness of its traditional flavor. Account with the Church (s. XVI), with its baroque altars and eighteenth-century organ, a square and town hall from which you can enjoy the views of the reservoir. 80 m. from El Molino there is the swimming pool and the municipal sports center, with a pediment, tennis courts, basketball courts and well-kept gardens. The Molino de Alocén has six double rooms with full bathroom, heating, reading room, large living room with views of the Entrepeñas reservoir, porch and garden, table games. Ideal for groups of up to 12 people, for families because of the spaciousness of its facilities, and for those who want to rest with tranquility, or look for other leisure activities. For the owners, the rest and the freedom of the people housed are paramount, so that they feel at home. The Board of Castilla La Mancha has described the rural house the Mill of Alocén with two spikes. Alocén is a small town located on the slope of the mountain overlooking the Entrepeñas reservoir, on the Tagus River. 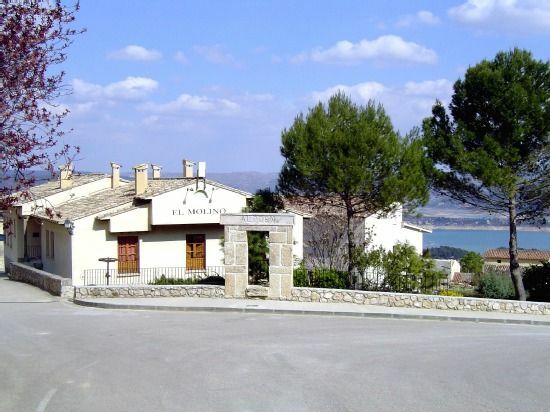 The house has excellent views of the reservoir and the oak forest of Las Matas, there are 2 viewpoints worth visiting. 80 m from the house is the municipal sports center, with swimming pool, tennis courts, paddle tennis, balocesto, fronton and children's games. Water lovers can fish, bathe, practice water sports. There are two zones of buitreras, usually vultures are seen gliding over the houses.